Although it’s firmly grounded in the theoretical foundation of AI, this course is about practical, engaging learning and application. To ensure enough individual attention, there will be a maximum of only 16 participants, so act now to secure your place! “The course was very cleverly designed to ensure we fully understood the concepts and had time to practice. My understanding of AI has really developed due to the course and learning from Andy was a really inspiring experience. The number of like-minded people was just right, venue was very comfortable and course material was really helpful as well as the practical ideas from the course. “We learned practical skills we could use immediately and confidently to achieve fantastic results. The trainers impressed us throughout both with their extensive knowledge and their generosity when sharing their experiences. One key factor for us was that the trainers remained flexible in their delivery to ensure our needs and expectations were met. Andy Smith is an Appreciative Inquiry facilitator, NLP trainer and Emotional Intelligence specialist. Originally trained by Anne Radford, he has been facilitating, coaching and training Appreciative Inquiry since 2007. Along the way he has introduced some useful new additions to the AI toolkit. Make the next course happen in your city, wherever you are in the world! If you have at least five like-minded colleagues who also want to learn Appreciative Inquiry facilitation skills, why not club together to bring me to your city? A core group of six is usually enough to justify me putting on an open course, as it will attract more participants. I’ll run the course even for five of you as long as I don’t make a loss! Contact me at andy@coachingleaders.co.uk if this might appeal. This course can also be run in-house. If you’d like to enquire about in company courses and bespoke training, then email Andy Smith today on andy@coachingleaders.co.uk and tell us what you would like us to provide. I took two groups of staff through this training a while ago and found it extremely useful. Not only did it provide them with tools to lead change and redesign services in the NHS,it also enabled a change of mindset to be seeded with them. Working in the NHS means having to deal with constant change and high levels of negativity. The AI approach allows teams to recognise their value , celebrate it and seek to build success from a positive perspective rather than the usual “this isn’t going well so how do we make it better” approach that we so often expose our staff to in the NHS. Personally experiencing sometimes cynical and jaded teams at the start saying things like “yes but what about ….” to observing that lightbulb moment when the energy sparks and they are excited about their own potential, is a real pleasure, and makes my job as a senior improvement manager so much easier. I always smile when we reach the provocative proposition and it is met with sneers, because we always win that one in the end… it’s the over the top of the trench moment for me! Interestingly, this course fits neatly with a customer services model we are currently delivering , so its useful to know that the course links to other agendas within the NHS too. On a personal note, since I undertook the training, I have incorporated the AI approach, the “heliotropic approach” into my day job, using it to support redesign, team coaching and LEAN. Thank you Andy for this great course . It was a great engaging training in which time just flew by and from which I gained sooo much – Appreciative Inquiry is great – highly recommended. It is very inspiring, practical and thought provoking. I came away feeling more committed than I have ever felt to taking action. Thanks Andy – You Rock! I really enjoyed the 2 days training and gained some practical, flexible, easy to use tools. The training was a good mix of input and a chance to try things out for myself. I felt I could go home and use it straight away, and as back-up a great set of notes and sample sheets to use in different contexts. Thanks Andy for an excellent couple of days, informative, eye opening and most of all, practical. I highly recommend this course for anyone involved in change of any sort. 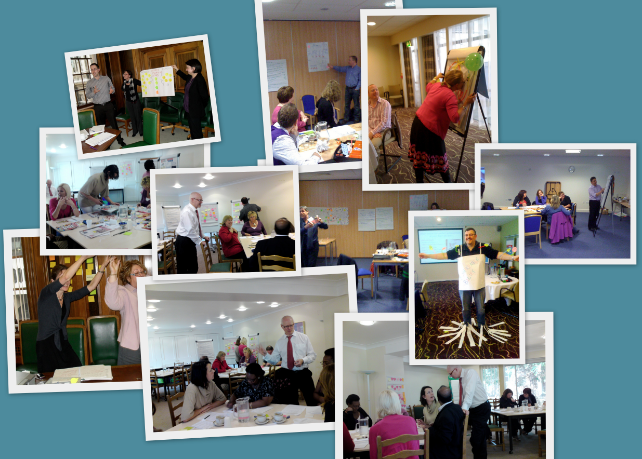 I am interested in the course, what are the course dates and locations for 2013? The course is on 18-19 March in Sutton Coldfield, W Midlands, UK (details are in the article above). No further dates set as yet. The venue is easily accessible from Birmingham Airport. No courses planned for Leeds at the moment (most of the people asking about the course have been in the South East). Any chance you can make it down to the London course on 19-20 February? Interesting and useful course, delivered by an expert in the field. I’ve been on Andy’s self-hypnosis and NLP training courses previously. He always stands out for his meticulous research and detailed knowledge of the topic. NB: Andy uses his knowledge to help and support us, *not* to show off. I also enjoy Andy’s relaxed style. He keeps the pace up, but you never feel pushed. It’s more a case of Andy creating an environment in which it’s ok to ask questions and get into discussions, but he knows when to move things on . Please send me some info where training takes place, and costs etc – I am a Carer, with long term chronic illness/conditions, but interested to keep learning about coaching and developing skills; I do some voluntary work in my community, with people with mental ill-health & Expert Patients Program, hard to get permanent work with my conditions : chronic all over body pain, stiffness, fibromyalgia, diabetes, coeliac disease, high blood pressure, cholesterol, and caring for my 77 year old godfather, he has cancer and cerebellum atrophy, after a major operation. I used to run an NLP PRACTICE GROUP when I was working and enjoy coaching and helping others; before I lost 5 people that were close to me incl my partner, both parents, brother, daughter, god daughter, and my job, and developing these conditions.